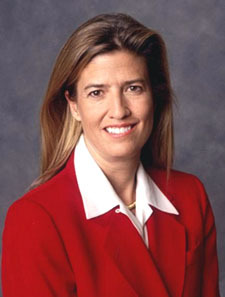 Greta Van Susteren covers legal matters for Fox News, and handled similar duties at Cable News Network from 1991 until leaving to join Fox in 2002. She has two law degrees and still works as an attorney, having handled court cases from divorce to murder. Until 1999 she was an adjunct law professor at Georgetown Law Center. Van Susteren is a member and large-scale donor to the Church of Scientology, which teaches that souls of murdered space aliens from 75 million years ago are now attached to Earthlings' bodies, and that for a fee the Church can have these cumbersome parasites removed. The top accountant at Van Susteren's law firm is the mother of Scientology chief David Miscavige. It is widely rumored that during her time at CNN Van Susteren pressured network executives to kill an investigation into Applied Scholastics, an "educational organization" that operates under at least half a dozen different names and is apparently controlled by the Church of Scientology. Her father was Urban Van Susteren, a County Judge in Wisconsin who was also a close friend of Sen Joseph McCarthy. He was campaign manager for McCarthy's smear-filled 1946 campaign that won the Senate seat from Sen Robert M. La Follette, Jr., who killed himself several years later. While McCarthy was a Senator, he roomed in the Van Susteren house when he was not in the nation's capitol. Van Susteren's husband, John Coale, is a wealthy trial lawyer whose clients include victims of such disasters as the Union Carbide accident in Bhopal and the 1996 Valuejet crash in the Everglades. He represented Lisa Marie Presley as she divorced Michael Jackson. Van Susteren is a partner in her husband's law firm, and in 1995 they were sanctioned by West Virginia's Lawyer Disciplinary Board for inappropriate solicitation of prospective clients -- "ambulance chasing", in layman's terms.